Wind turbines with three-point suspension have a main bearing in front of the drivetrain. This main bearing absorbs the axial force and part of the radial force. The yaw and bending moments lead to a tipping of the drivetrain due to the deflection of the elastomeric gearbox support. To compensate for the tipping of the drivetrain, a spherical bearing is normally used as the main bearing. Axial deflection is possible in these bearings (if not pre-stressed), leading to high axial gearbox shocks. A tapered roller bearing is used in the ESM main bearing isolation. As these bearings are pre-stressed, no axial shock from the axial movement in the main bearing is possible. 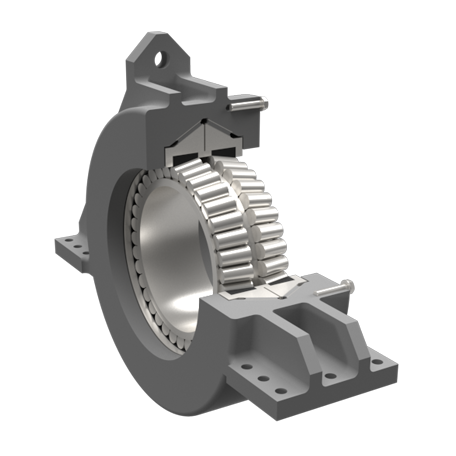 An elastomeric isolation system is positioned between the tapered roller bearing and the housing to enable the tipping of the drivetrain. Furthermore, this elastomeric isolation leads to higher drivetrain damping and the isolation of acoustic noise between the drivetrain and the main frame. In the high MW wind turbine class, the elastomeric main bearing isolation provides a commercial alternative to four-point-suspension. The system can be adapted to different roller bearings.